Avital Hirschhorn, one of Maryland Hillel’s OU-JLIC Torah educators, struggled to find a way to create a weekly event that is both fun and educational. After extensive brainstorming, Hirschhorn discovered that the best way to incorporate both elements was to set up a weekly event called Challah and Chassidut. 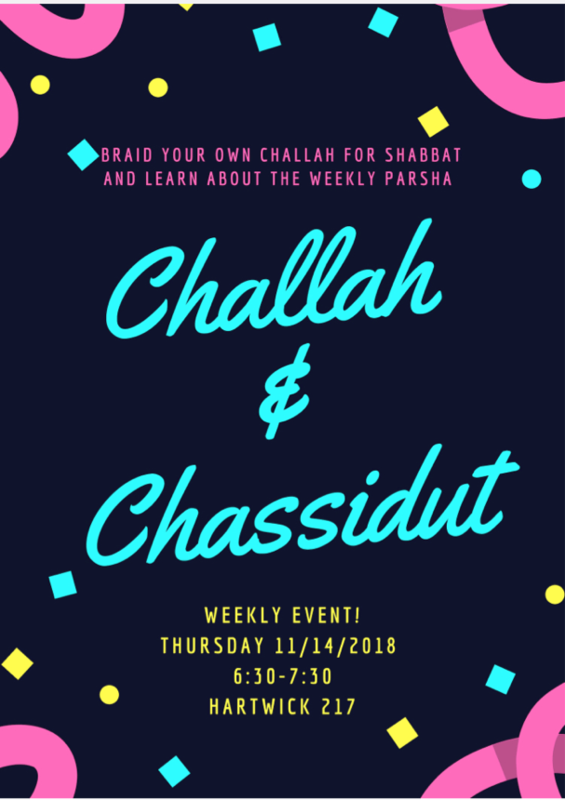 A flyer promoting the Challah and Chassidut event. Photo provided by Avital Hirschhorn. Challah and Chassidut is a weekly program intended to engage students in discussions about Jewish topics while baking challah, an opportunity that is difficult for many to turn down. “I think it is one of the best things JLIC does. I learn a lot and I tell so many people about what I learn… also, I love making challah for Shabbat, so since they offer that, I go,” said Ariella Golish, a junior business major. Chassidut is the study of Hasidic philosophies. Also known as “Chassidus,” it contains teachings of the Hasidic movement. Most often, these lessons are found in commentary on the Kabbalah and Torah. One of the main goals of this event is to attract new groups of students each week. Hirschhorn attempts to do this by rotating the location of the weekly meeting. “Every single week, I’ve been getting a different crowd of students, depending on who’s hosting… it’s nice to get different types of students every week,” she said. Despite Hirschhorn’s desire to diversify the students by branching out the location, some attendees feel that having a set location may be more practical. “It may be helpful to have the event in the same location each week to make it easier for everyone, but other than that the program is perfect the way it is,” said Nicole Wohlberg, a sophomore Letters and Sciences student. After a long week full of assignments, tests and other stressful tasks, many students feel that Challah and Chassidut is the perfect program to relax and have a good time. “I really like the learning aspect because after learning secular subjects all week it’s great to learn the parsha or any other Jewish topic, especially before Shabbat,” said Lindsay Haimm, a freshman Letters and Sciences student. Additionally, Haimm enjoys the Thursday night event because it helps her get in the spirit of Shabbat, which falls on Friday nights. Many students also enjoy this program because they are able to hang out with friends and take part in a meaningful activity at the same time. “I think challah-making is one of the most important mitzvot for a woman so I’m so thankful I get to do it every week! Also I’m always studying so it’s a good time to see friends,” said Golish. Hirschhorn notes that the program is open to all students, but has only been attended by female students so far. She hopes to change this in the future. No Replies to "New program, Challah and Chassidut, takes Thursday nights by storm"